It was double-gold for individual champion Ramzy Al Duhami yesterday as The Kingdom of Saudi Arabia impressively dominated the Jumping competitions at the Asian Games in Guangzhou, China. On Monday the 38 year old rider joined Khaled Al Eid, HRH Prince Moteb Al Saud and Abdullah Al Sharbatly to take the team title ahead of the United Arab Emirates (UAE) who pipped Hong Kong, China in a thrilling third-round jump-off against the clock. And for the UAE there was also a double to celebrate yesterday as Sheikha Latifah Al Maktoum claimed her second silver medal of the Games when finishing only fractionally behind Al Duhami in the jump-off for the individual title. The bronze went to 2000 Olympic bronze medallist Al Eid who had two fences down in the three-horse decider. The talented and experienced Saudi team were always going to be the ones to beat, and with four clears in the first round went straight into the lead while the UAE carried just three faults collected by Sheikha Latifah and Kalaska de Semily when both Sheikh Majid Al Qasimi (Co-Jack) and Ahmed Al Junaibi (Picobello Wodiena) left the course intact - fourth-line rider Sheikh Rashid Al Maktoum (Dubai's Pride) providing the discount eight-fault score. The Korean team was lying third at the half-way stage with just five faults on the board, but the Hong Kong quartet were only one point further adrift and when the Koreans faltered second time out then Hong Kong's five additional penalties left them tying for the silver medal with the UAE on 11 faults apiece after two rounds of jumping. The defending champions from Saudi Arabia meanwhile were already clear victors as both Al Duhami (Bayard V Devilla T) and Al Eid (Presley Boy) kept a clean sheet so the only faults they had to count were the four collected by Al Sharbatly (Melodie Ardente), the man who launched himself onto centre-stage when claiming individual silver at the recent Alltech FEI World Equestrian Games™ in Kentucky, USA. Just three riders from each side lined out in the two-nation clash for the silver medal and the UAE looked vulnerable when pathfinder, Sheikha Latifah, picked up four faults. However Sheikh Al Qasimi was clear and when Sheikha Latifah's 18 year old brother Sheikh Rashid returned with just a single time fault then their five-fault total proved plenty good enough to give them the advantage as Hong Kong's Patrick Lam (JC Tilburg) and Jacqueline Lai (Capone) each had a fence down while Samantha Lam picked up a very expensive 16 faults with JC Crunship. Al Duhami was delighted with the Saudi win but complimented the opposition. "Both the Hong Kong team and the UAE are strong competitors which added to the pressure. We had even more pressure because our Prince (HRH Prince Nawaf) was present, but we tried hard to focus in each round. We hoped for the best and we did our very best" he said. And it was an emotional moment for silver medallist Sheika Latifah - "I'm crying because I am so happy!" she said, although she admitted that she was "very nervous" when she realised there would be a jump-off for the silver. Sheikh Majid, who clinched that silver with his foot-perfect tour of the 13-fence jump-off track, pointed out that the UAE was a relatively young and inexperienced side "but we've worked hard to be here" the 25 year old rider pointed out. And it was the ideal result for the country that took bronze in Doha, Qatar four years ago as they stepped up to the mark and improved on that result. It was also quite an achievement for the bronze medal winners from Hong Kong who were taking their first medals at the Asian Games. Of the 24 starters in yesterday's individual final just six found the key to the first-round track, and when that dwindled to just three second time out then a thrilling finale was guaranteed. Al Duhami's time of 48.52 seconds proved the winning one when Sheikha Latifah opted for a more cautious tour of the course built by Australia's John Vallance which saw her break the beam in 48.83. When Presley Boy had both the first and last fences down then Al Eid had to settle for bronze. "In the jump-off I had to give it a go because I had some of the best riders in the world behind me. The first down was a small mistake, just a slight touch, but the last fence down was a bigger mistake. I changed my mind for the distance and that was wrong" Al Eid explained. Sheika Latifah was much more relaxed going into the final jump-off - "I felt no stress because I already knew that I had medal!" she pointed out, adding, "we had a strong competition today with world-class riders and just to be amongst them was an honour for me". The newly-crowned individual champion Al Duhami said "I feel happy, excited and honoured to win this Championship. My horse did a super job, which makes me very happy. He jumped well from the beginning. Later I was worried that he would be a little tired and things would become difficult for him, but he still wanted to jump. I think he is ready for bigger world competitions now, even though he is still quite young" he pointed out. The equestrian competitions at these Asian Games were ground-breaking as, for the first time in 60 years, horses were permitted to travel in and out of the Chinese mainland due to stringent new veterinary procedures. Previously horses could enter China, but would not be permitted to return to the international equine community due to fears of disease-spread. The facilities provided by the Asian Games organisers were greatly appreciated by the equestrian competitors and UAE coach, Dietmar Gugler, said "we were surprised when we arrived last week. The stables and the footing are excellent, which is very important, and the courses were designed very well so the riders and horses performed well". And Saudi Arabian coach Sami Al Duhami agreed. "At first I had doubts about whether we should come to the Asian Games because the biggest challenge was how to get the horses to Guangzhou, but that turned out successfully. The facilities here are great and the horses are well taken care of - I think equestrian sport in Asia will grow from here" he added. 1 (Gold) Kingdom of Saudi Arabia 4 faults - Vayard V Devilla T (Ramzy Al Duhami) 0/0, Presley Boy (Khaled Al Eid) 0/0, Mobily A Obelix (HRH Prince Moteb Al Saud) 0/8, Melodie Ardente (Abdullah Al Sharbatly) 0/4. 2 (Silver) United Arab Emirates 5 faults (in jump-off) - Kalaska de Semily (Sh Latifa Almaktoum) 3/0/4, Co-Jack (Sh Majid Al Qasimi) 0/8/0, Picobello Wodiena (Ahmed Al Junaibi) 0/4/WD, Dubai's Pride (Sh Rashid Al Maktoum) 0/4/1. 3 (Bronze) Hong Kong, China 24 faults (in jump-off) - JC Can Do (Man Kit Cheng) 0/0/WD, JC Tilburg (Patrick Lam) 4/1/4, JC Crunship (Samantha Lam) 17/4/16, Capone 22 (Jacqueline Lai) 2/8/4. 1 (Gold) Bayard V Devilla (Ramzy Al Duhami) KSA 0/0/0 48.52; 2 (Silver) Kalaska de Smily (Sh. Latifa Al Maktoum) UAE 0/0/0 48.83; 3 (Bronze) Presley Boy (Khaled Al Eid) KSA 0/0/8 47.50. 8 nations competed for the team honours - Saudi Arabia, Hong Kong China, United Arab Emirates, Qatar, Korea, China, Japan and Chinese Taipei. 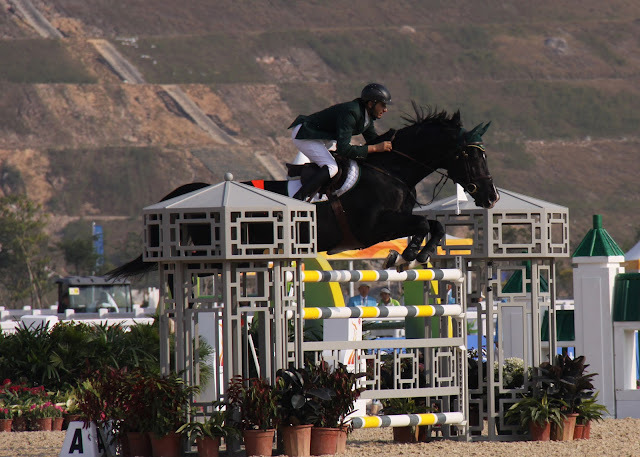 There was a two-way jump-off, between the UAE and the team from Hong Kong to decide the silver medal after both teams completed the first two rounds with 11 faults. It was the first time in the history of the Asian Games for a team from Hong Kong to take a Jumping medal (bronze). Two horses jumped four clear rounds during the Jumping competitions at the Asian Games - individual champion Ramzy Al Duhami's Bayard V Devilla T and Sheikha Latifah Al Maktoum's Kalaska de Semily. Qatar's Mubarak Alrumaihi (Castiglione) finished closest to the individual medal winners when finishing fourth, carrying just five faults. Team bronze medallist Man Kit Cheng (HKG) - "The longer you work with a horse the better the performance can be. I have been working with my horse (JC Can Do) since the Beijing 2009 Olympic Games and I train with him every day".